35 year old Khoun Horn from Kos Kchey Village, Bakan District, appears as Miss Pursat. Married with four children, she works as a farmer with a goal of starting a small sewing business. Her mine accident in 1982 was caused by a locally produced $10 PMD-6 shoe box mine with 200 grams of TNT. Photography by Gorm K Gaare, © Miss Landmine 2009. 47 year old Sou Mao from Sam Roung Village, Chrey Commune, appears as Miss Prey Veng. A widow and the mother of two children, she sells cake in her village, with an ambition of having a real business. Her mine accident in 1979 was caused by an APP M-57 blast mine with 200 grams of TNT, manufactured in the Democratic People’s Republic of Korea. Photography by Gorm K Gaare, © Miss Landmine 2009. Everybody has the right to be beautiful, says Morten Traavik. The goals named on the Miss Landmine site are female pride and empowerment, disabled pride and empowerment, global and local landmine awareness and information, challenging inferiority and/or guilt complexes that hinder creativity, whether they be historical, cultural, social, personal, Asian or European. The campaign questions established concepts of physical perfection, challenges old and ingrown concepts of cultural cooperation and celebrates true beauty. Traavik aims to replace the passive term ‘victim’ with the active term ‘survivor’, and is committed to ensuring that all involved in the process have a good time! The Miss Landmine concept was created and directed by Morten Traavik with support from Cambodia ground operations manager Ngin Saorath, photographer Gorm K Gaare, styling and costume designer Lena Thorsmæhlum (Myff Design), main event coordinator Chath PierSath, assistant coordinator Khoun Socheata. Photos were taken at Angkor Wat temples, Bayon temple, Ta Phrom temples and Shinta Mani Hotel in Siem Reap, Blue Lime Hotel, Chinese House and The Quay Hotel in Phnom Penh, and Knai Bang Chatt Hotel in Kep. The site was developed by Pixel Dynamics and laid out by Tundra Group. Credits are given to countries involved in producing the landmines: Burma, Iran, Russia, Cuba, Korea (North and South), Singapore, China, Nepal, USA, India, Pakistan and Vietnam. 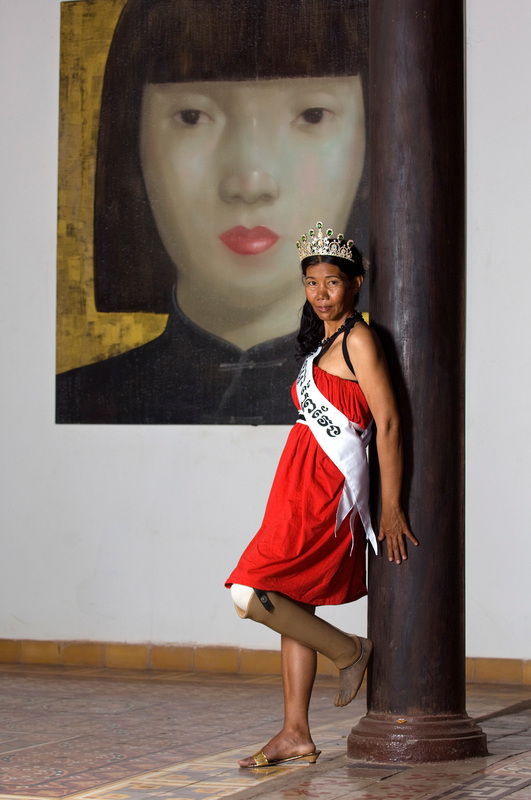 The Miss Landmine campaign was funded and sponsored by the Arts Council Norway (Norsk Kulturråd), the Norwegian Ministry of Foreign Affairs.